Free Speed Stick Deodorant + Free Shipping! Men’s Speed Stick offers long lasting, odor fighting protection all day long with a refreshing, clean scent. 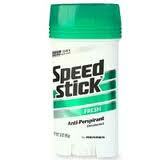 Offer applies to Speed Stick, Clear, Active Fresh Deodorant 2oz while supplies last. The WILD Cash Back Reward will be posted to your ShopAtHome.com account within 30 days of purchase. WILD Cash Back Rewards apply only to the products listed. Limit one per ShopAtHome.com customer. Not valid with any other coupon or rebate program. Please review Cash Back Guidelines for other items purchased from the store. WILD discount good only while supplies last, No Rain Checks. ShopAtHome.com rebate checks are mailed monthly, within 90 days of item purchase, as long as you haven’t returned the product to the store, and you have a minimum balance of $20 in your ShopAtHome.com account.